Während der Dam Tage erbaut, von Bill und Hertha Moore, mit Hungry Horse Dam Beton und Altwachstum Douglasie aus dem Rex Brown Sägewerk in Coram, ist das Moore House solide wie ein Fels. Warm und gemütlich im Winter und kühl und luftig im Sommer, werden Sie Ihren Aufenthalt in der Moore House genießen. Eingebettet zwischen Abt Creek und dem Nahen Fork des Flathead River, sieht die Moore House Süden nach Columbia Berg und Badrock Canyon. Nur 400 'von US- Autobahn 2 ist der Zugang einfach im Winter. West Glacier und Glacier National Park sind nur 9 Meilen entfernt und Big Mountain Resort ist nur 20 Meilen entfernt. Das Gelände besteht aus 2 Morgen Gärten und Rasenflächen - ideal für Hosting-Partys im Freien, Grillfeste und Familienfeiern - und 3 1/2 Morgen Urwald. Es gibt viele Tiere und Vögel zu genießen, mit Hirsche, Elche, Elch- und Bären frequentieren die Eigenschaft, also halten Sie scharf Ausschau, wenn Sie in den Wäldern sind. Canyon Foods, in der Nähe von Hungry Horse, hat eine ausgezeichnete Metzgerei und Lebensmittel und mehr Shopping ist in Columbia Falls vorhanden, nur 8 Meilen nach Westen. Es gibt viel zu im Freien mit Weltklasse Freizeitmöglichkeiten im Glacier National Park und dem Flathead National Forest zu tun. Für diejenigen, die Abenteuer suchen, Wildwasser-Rafting auf der Middle Fork, Jagd und Fischerei in der Flathead National Forest, Wandern und Klettern im Gletscher und Skifahren und Snowboarden in Big Mountain winken. Für diejenigen, die einfach nur entspannen möchten, genießen Sie die Ruhe der eigenen Urlaubsort und die Annehmlichkeiten des Moore House. Große Terrasse und Gartenbereich für Familienfeiern und unterhaltsam. Lovely Location; Comfortable Accommodations for a Family! We returned from a late-August stay at this wonderful property with nothing but positive reviews. The rooms were clean and spacious, with additional features that made our family's time in Montana even more pleasant than we hoped for. With three generations visiting the Glacier National Park area, this was the perfect home base from which we could not only go on adventures, but at which we could happily spend entire days playing badminton in the yard and spending time as a family. The yard was well kept, beautifully landscaped, and safe for kids to play while a covered patio area adjacent to the house was where we ate meals and visited while enjoying the air. Proximity to the park would have been unparalleled had the wildfires not been in full force, but we had easy access to the highway despite the quiet location, with many other sights readily available (Whitefish, Hungry Horse Dam, Flathead River). With no reservations would we return to this house in the future or recommend to others looking for a comfortable and happy family retreat to the West Glacier area. Thank you to the owners for a memorable and happy stay! Great stay in a beautiful place! Great house in a nice location. The owners are very easy to work with. Highly recommend. Wonderful location and peaceful setting! We booked this property as part of a family reunion. Because there were 35 of us in multiple locations, we valued the flexibility that this home gave us for housing cousins. Lots of beds, several bathrooms, well equipped kitchen, and generous supplies. In addition to staying in a clean and well-cared-for home, we enjoyed the added bonus of an outside seating area and beautiful yard. The hosts/owners were very good to work with in making the arrangements and welcoming us to their property. Our family enjoyed a week in this lovely, home-away-from-home set on a lovely, secluded & safe grounds while also minutes from West Glacier. All that we needed was provided, from comfy beds, to plenty of bathrooms, a pleasant living room, covered patio with grill & fireplace just off the kitchen. We would stay here again! 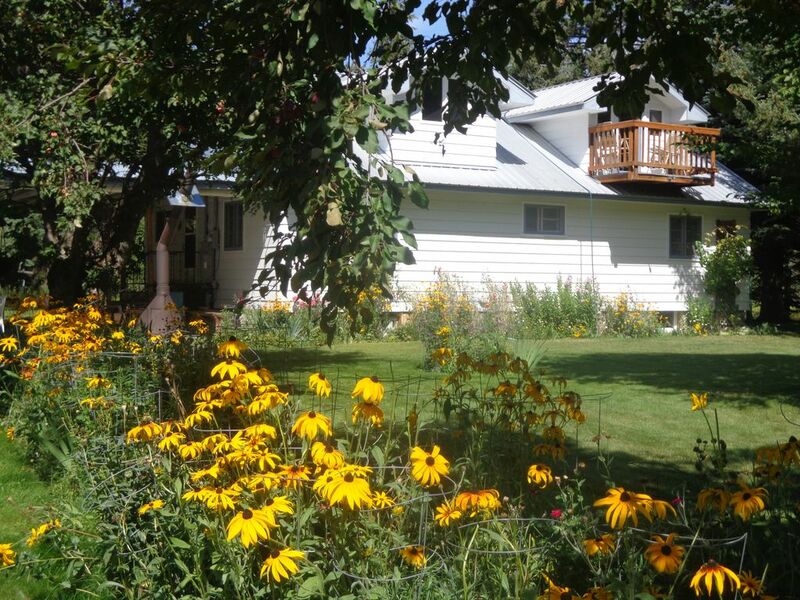 We had a wonderful stay at this home near Glacier! There were 9 of us and there was plenty of space. The beds were comfortable and the kitchen had all the dishes and utensils we needed. The home feels secluded yet close to grocery store, gas station, and a couple of nice shops (The Huckleberry Patch). The owners were super responsive and easy to work with. Would have liked to have a second shower in upstairs bathroom rather than a bath with shower head, but we made do since there is a full shower in master as well as in basement. Carol returned our security deposit while we were still there. Definitely recommend this home to all!